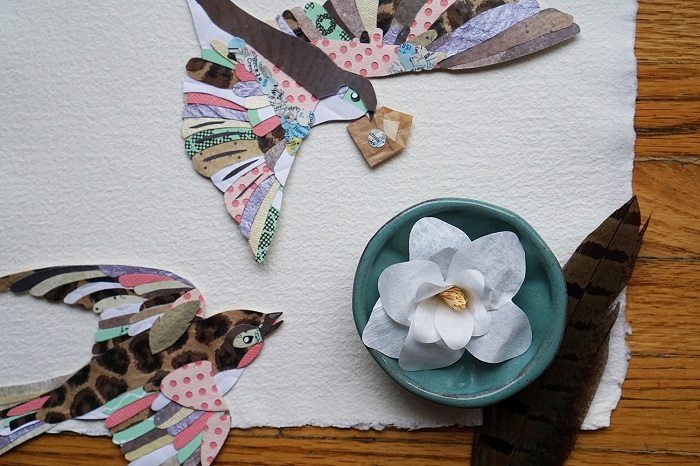 Oh, the amazing things you can do with paper. There are countless creatives who will prove that it’s definetly a lot. 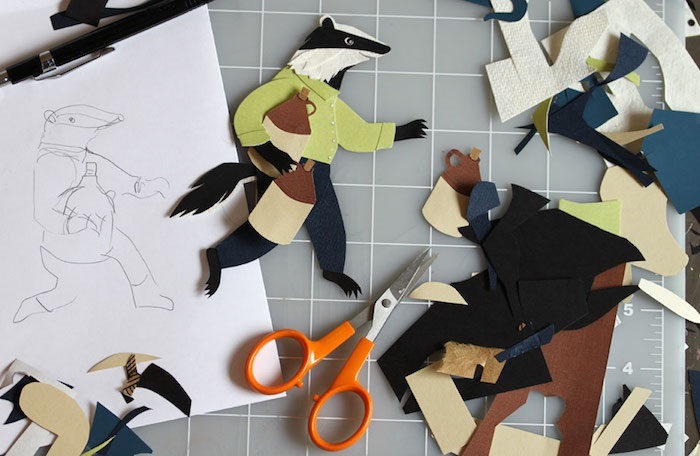 Paper gives an extra dimension to illustrations, making things that are otherwise bound to their surface bloom up and come to life. 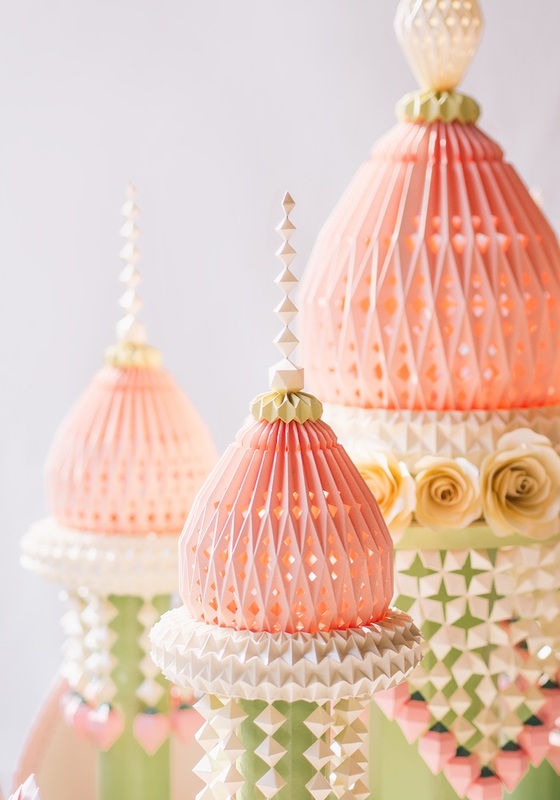 It takes good skills and patience, but the results can be stunning! Have you ever visited the Instagram account called Back to Poetry? 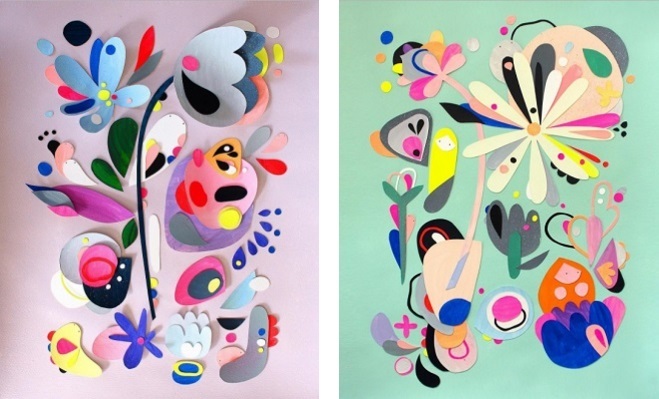 It’s where Stockholm based designer Hanna Nyman creates visual poetry in the shape of colorful papercut flowers, often combined with painting. 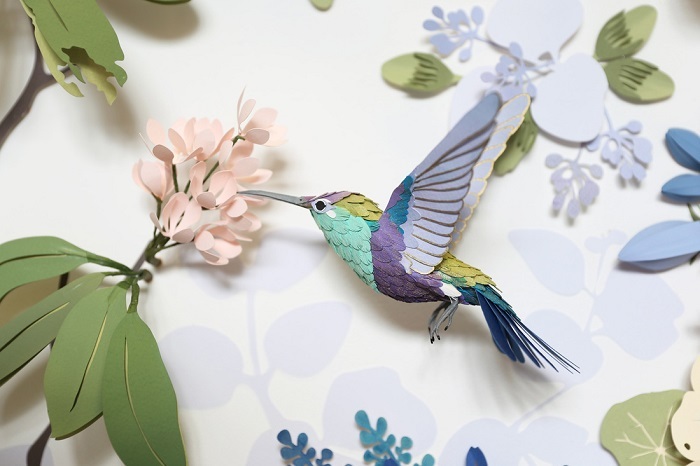 I love the soft colors of her paper pieces. Very pretty! 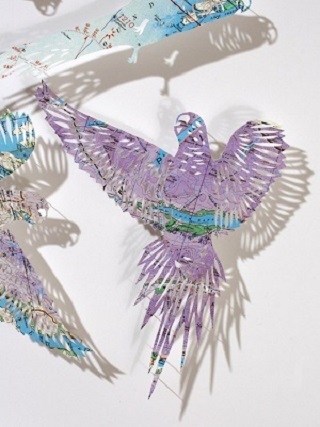 Elsa Mora was one of the first paper artists I wrote about on this blog. 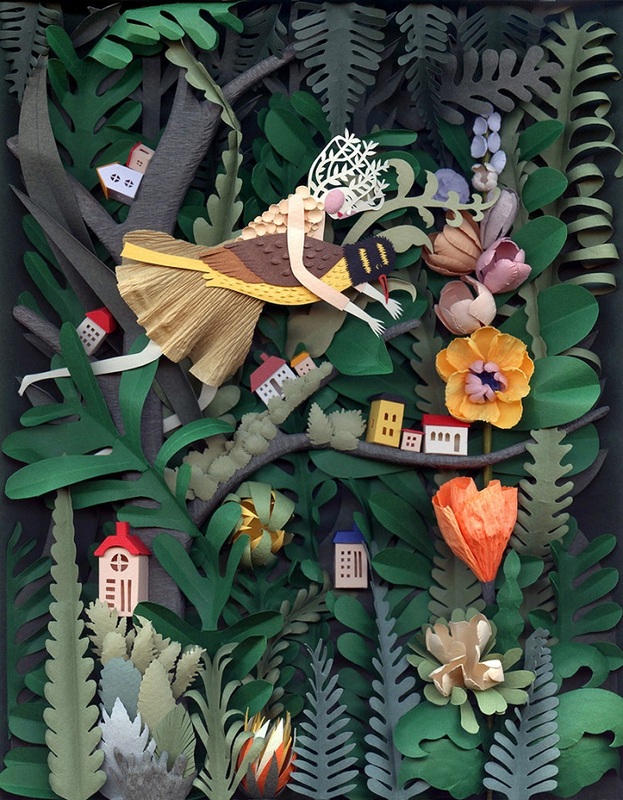 From papercut pieces to three dimensional sceneries, everything she creates has a beautiful, whimsical style that is adored by many. 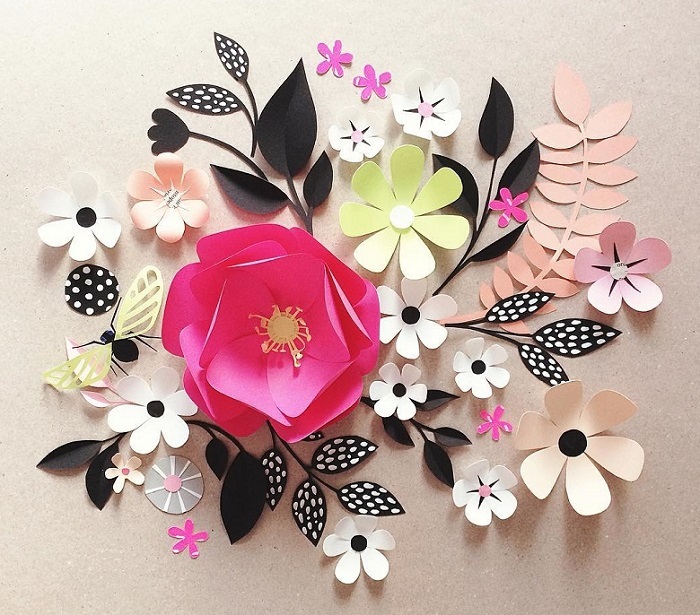 Elsa also has an inspirational blog called All About Papercutting that introduced me to many amazing paper crafters. 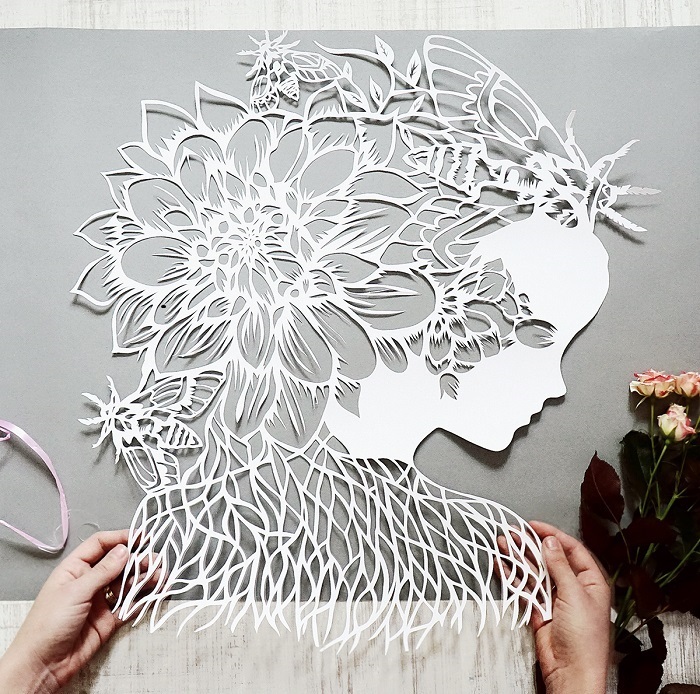 Based in Kiev, Ukraine, artist Eugenia Zoloto takes many hours to first draw sketches and then cut out all the drawn figures and details by hand. But the results are defietly worth it. 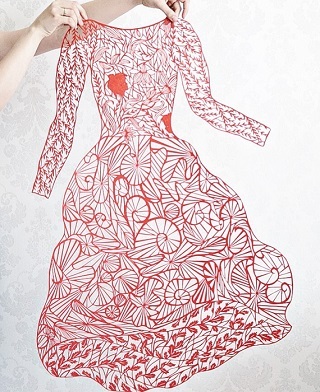 Notice that some of her works, like the red dress, are really large! 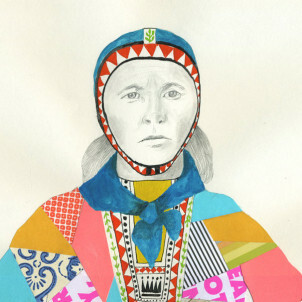 You can find a nice collection of Eugenia’s work available on Etsy. What I love about papercut illustrations is that they make me focus on the tiny bits of paper you can spot in the artworks. 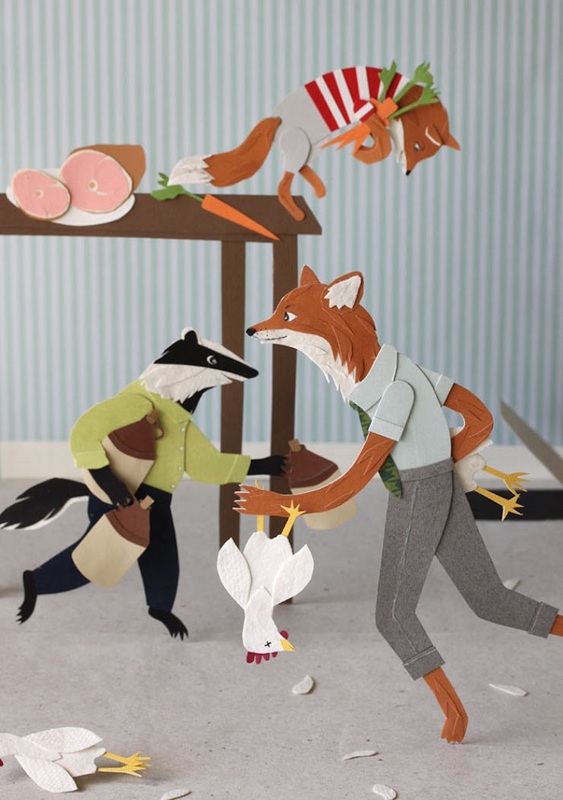 Like in this beautiful piece by Jayme McGowan; the paper details bring Mr. Fox to life! 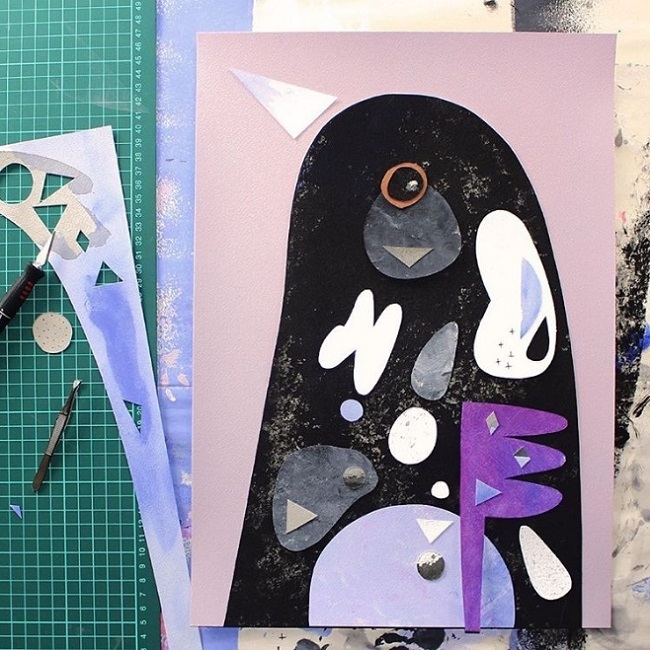 Jayme starts her projects with brainstorms, sketches and color experiments. 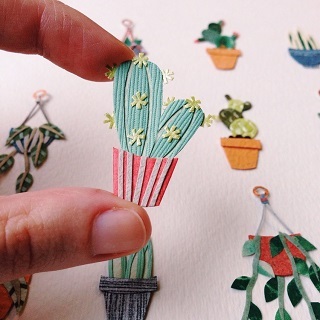 She creates the papercut pieces with tiny scissors and even tweezers to carefully put all the pieces into place. 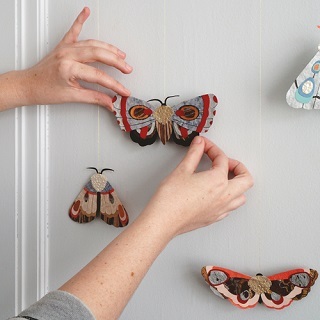 The pieces are then staged in a paper theatre (imagine an oversized shadowbox) by applying them to thread or wire. She photographs her works and, finally, makes some minor adjustments to the images in Photoshop. I like people to be able to see where the materials have come from as well as what I have turned them into, evoking that childish curiosity we all have somewhere inside! Nature is ever present, even in the most urban environments. 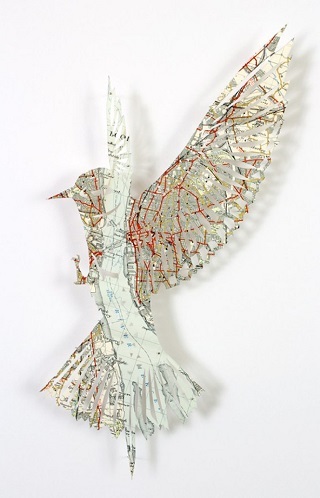 With that philosophy in mind paper artist Claire Brewster creates impressive sculptures out of outdated maps and atlases, giving them new lives in the shape of both delicate birds, insects and flowers. Absolutely amazing! Up to the tiniest detail, Brittani Rose creates beautiful portraits on request using nothing but colorful paper. She started off her brand two years ago with a personal family portrait and now has an incredible portfolio of people, pets, wedding days and many more, all in that same adorable style. You’ll find some very nice work-in progress pictures on Instagram where you can see how incredibly detailed her works are. You can get your own custom portrait here! 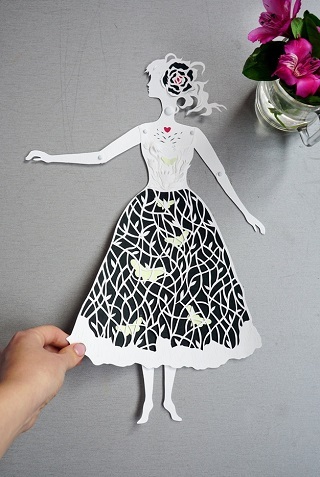 Oh, the fabulous things you can do with paper.. Well not me. 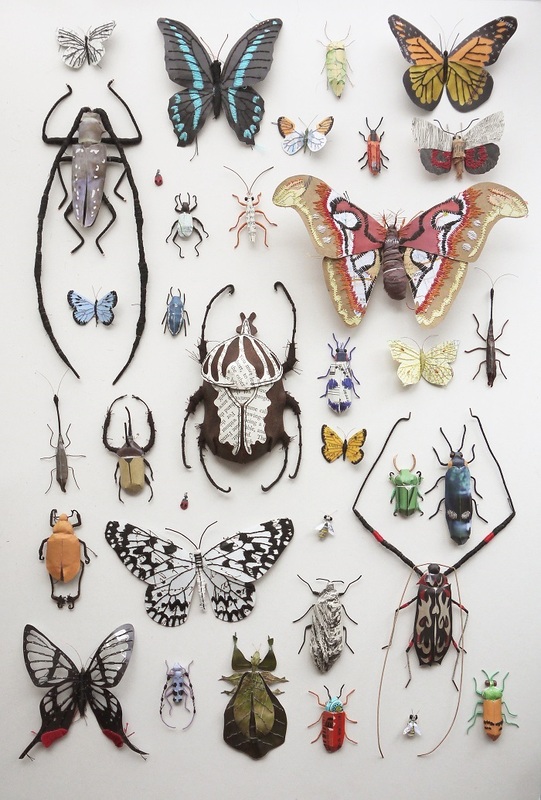 But in case of Bangkok-based artist Wiri Chaowana, pretty much everything. 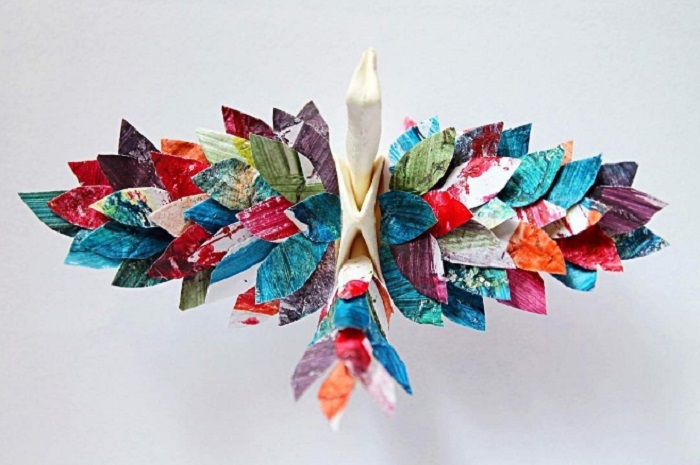 Wirin creates flowers, pendants and even complete tower-sculptures that are showcased in exhibitions regularly. A lot more of Wirin’s creations can be found on Behance. 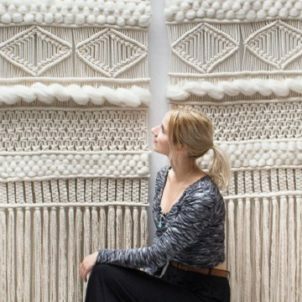 Tired of frames, Sonia Poli decided to make something that ignores them. 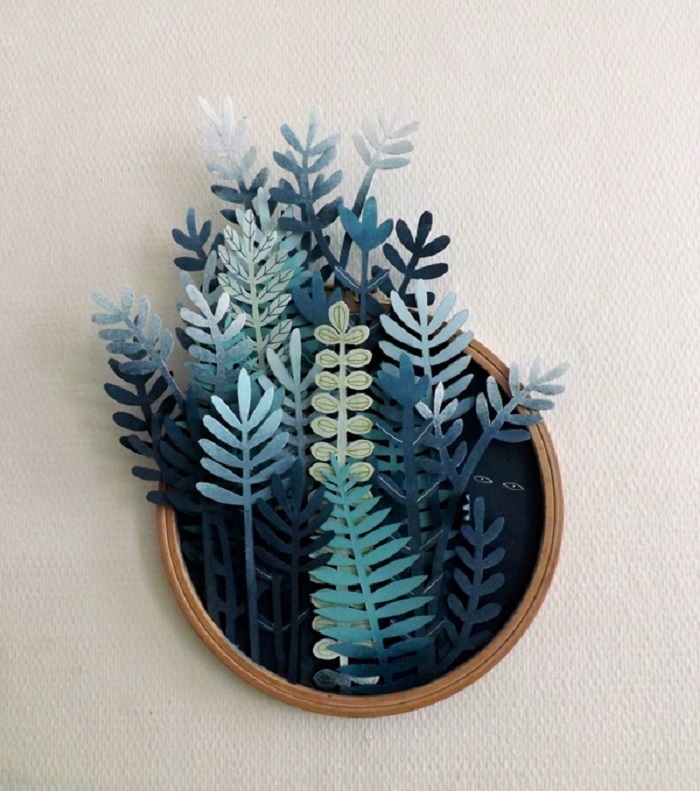 The result: a delicate paper collage called Vegetal Gradiant. Outgrowing the plate it’s portrayed in, it has carefully cut leaves that look like they will be hitting the ceiling shortly. And look: it has a well-hidden character peeking right at us! I wrote about the work of Pete Cromer this week, but had to mention his work again. 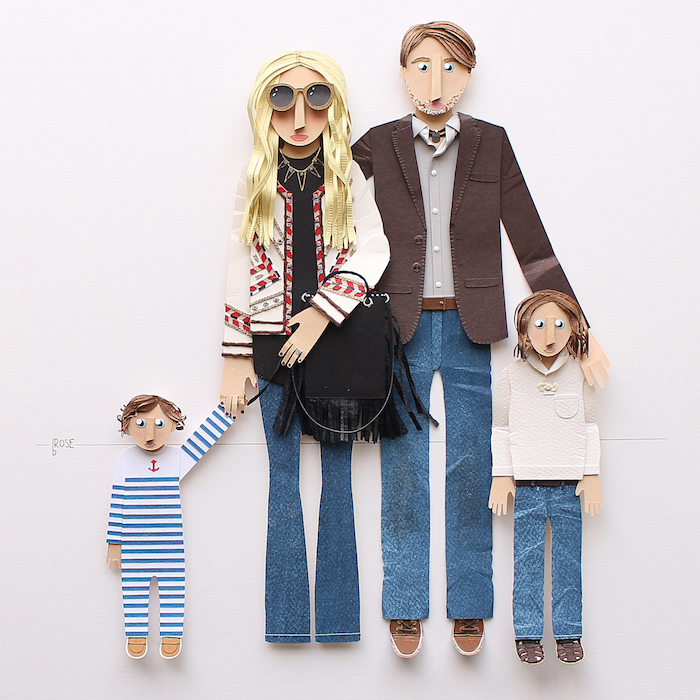 Pete is a designer, illustrator and artist who creates all kinds of loveliness from cut & painted pieces of paper. 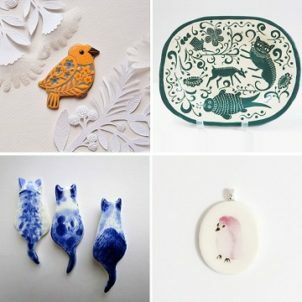 He also creates sculptures, like these wonderful Resin Budgerigars. Love! 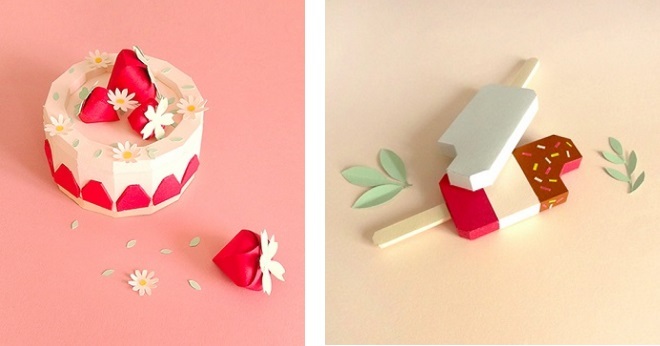 These pies, popsicles and lemonades by Charlotte Smith look soooo yummy.. but then again, who would want to eat such pretty paper delight? 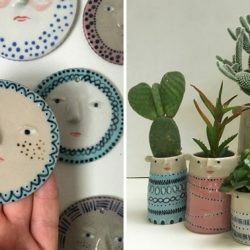 Charlotte is a Amsterdam-based graphic designer who is in love with pastel colors and has created works for numerous brands including Tesco Food & My Little Paris. Diana Beltran Herrera is a Colombian artist who creates stunning installations and sculptures with wire, cardboard, plastic, and paper as the primary medium. 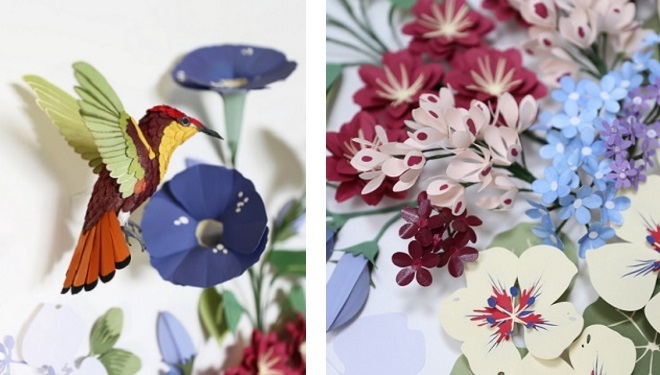 I allso love her Official Mail project in which she explores Southeast Asia’s flora and fauna with paper sculptures on mailstamps. 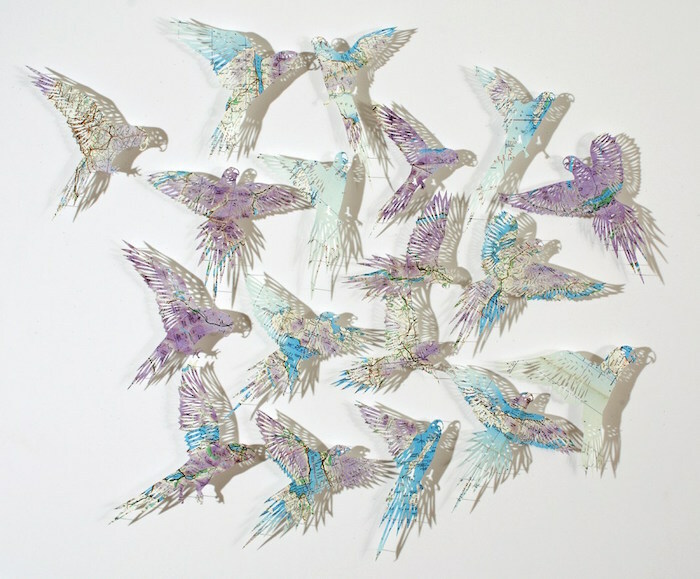 When I first saw Gunjan Aylawadi’s installations I coudn’t wrap my mind around the fact thet they are entirely made out of paper. 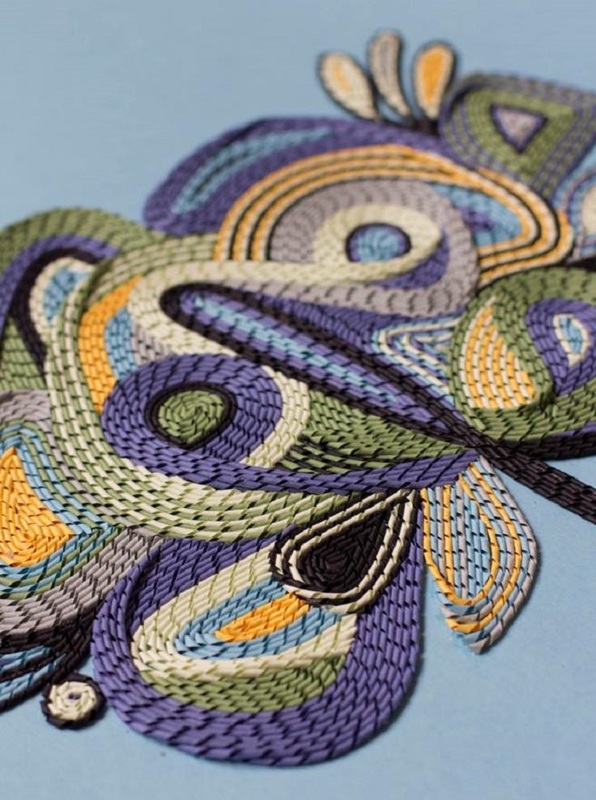 Cut, curled and turned into the most amazing creations that are inspired by patterns and motifs in Islamic art. Gorgeous! 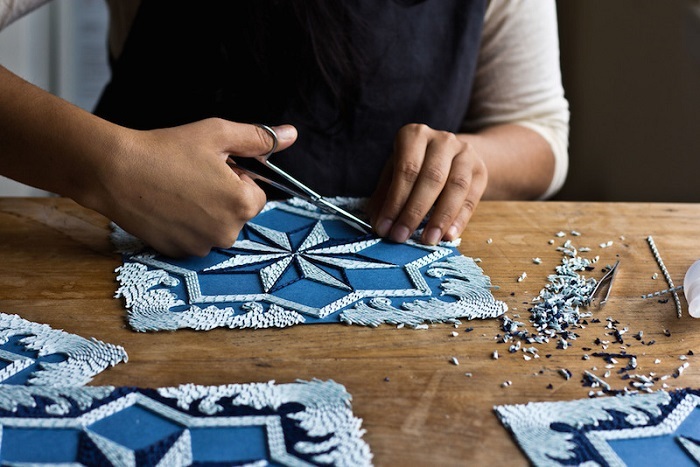 Her work involves a process that can take Gunjan up to months; after drawing designs by hand, Gunjan carefully applies layers of curled paper, resulting in unique, tapestry-like designs that have been installed at art events since 2013. 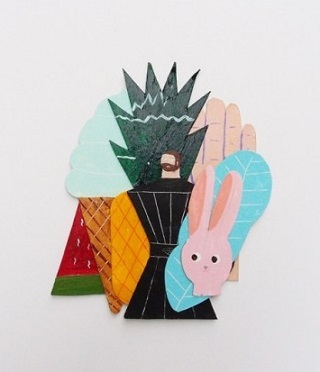 I adore everything that comes out of the hands of artist Miju Lee. 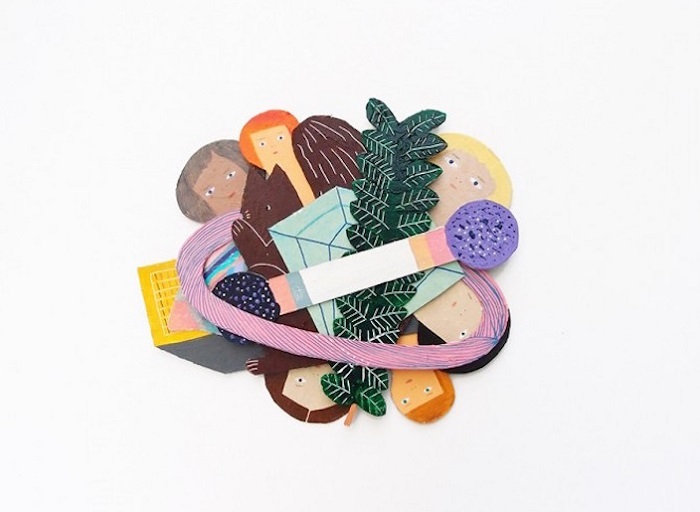 She works with different materials, but these superfun paper collages are one of my favorites. 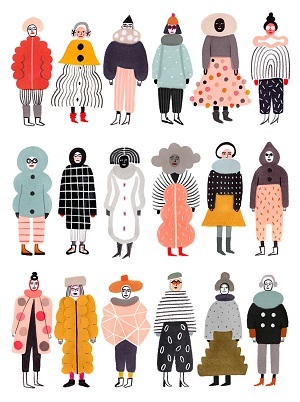 Miju Lee is originally from South Korea and currently lives and works in Barcelona. You will find many more loveliness on her site. 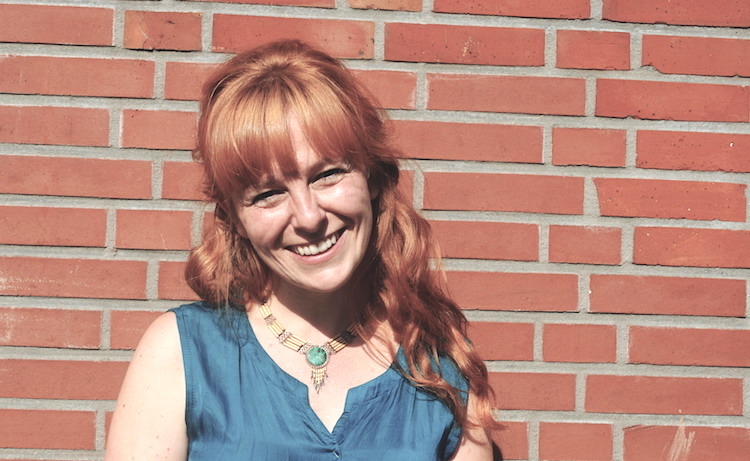 When Tara Galuska was five she wanted to be either a unicorn or an artist. She ended up becoming an artist with a passion for paper (and still has unfulfilled wish of being a unicorn too). 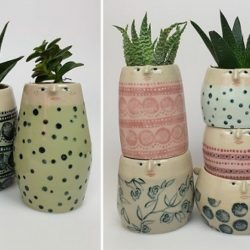 She creates the most beautiful and adorable pieces of art that will look fabulous in any living room (it does in mine!). 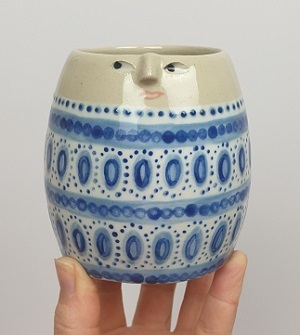 Many of Tara’s creations are tiny which is what I love about her work. 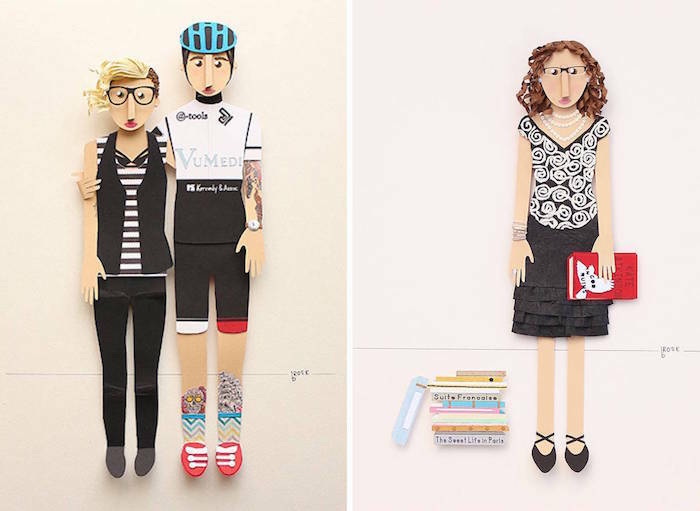 On her site you can find many more of her paper creations. 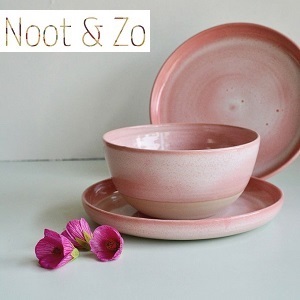 To get a list of all the pieces that are currently available visit this page. 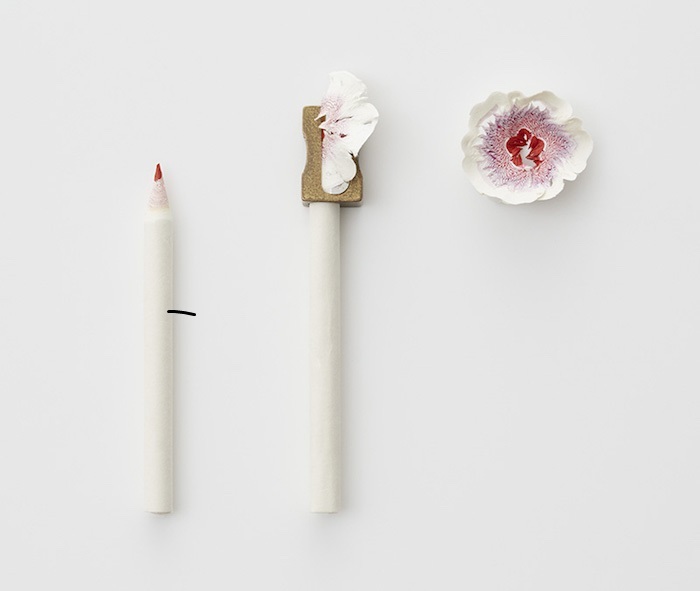 Japan-based designer Haruka Misawa was charmed by little pieces of shavings that were formed after sharpening her pencils. 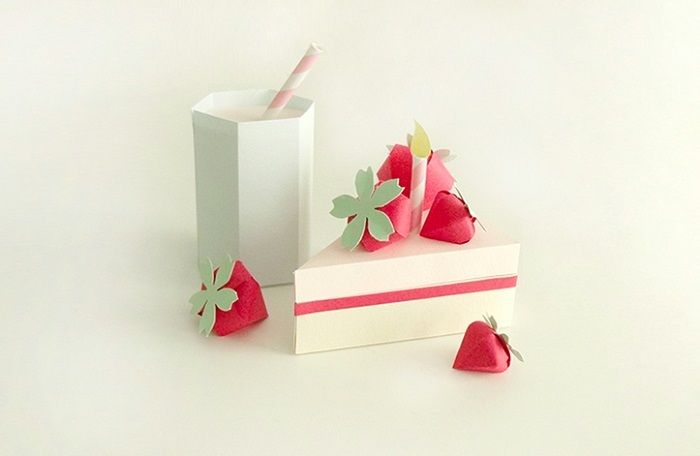 That’s when she started to create colorful paper layers in pencil-like shapes that result into tiny, delicate flowers after using a sharpener on them. Love! 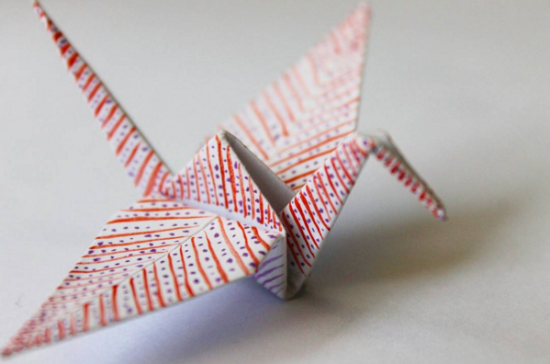 If you’re into origami and paper cranes, you will LOVE this amazing Instagram feed. 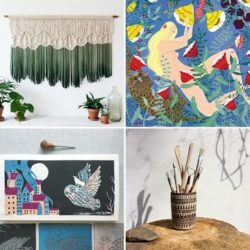 It’s where Cristian Marianciuc shares a beautiful new crane every day, in all kinds of colors and models (including thread, beads and papercut techniques). They’re part of a long term project that he started at the beginning 2015 and is till running. 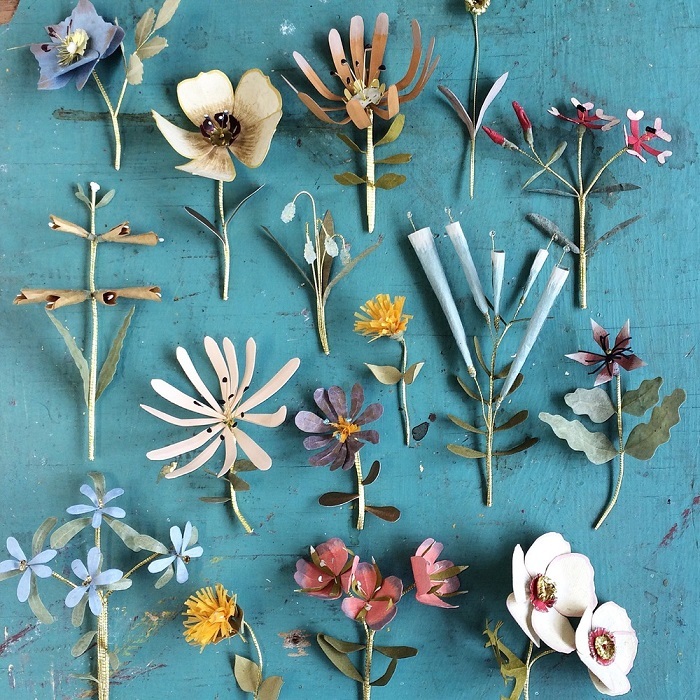 Inspired by historical botanical prints, artist Ann Wood creates beautifully handcrafted flowers using paper and wire. 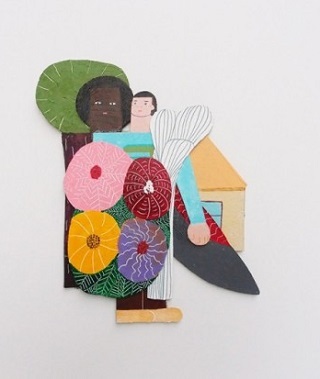 The flowers are sewn onto fabric and framed, resulting into tiny gardens you can hang on the wall. So beautiful!